St. Luke's College has developed and strengthened partnerships with other higher education institutions in Sioux City and the surrounding communities. 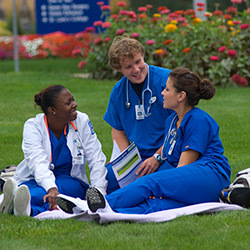 St. Luke's College has developed an associate degree program for nursing, which meets the basic education requirements of the Iowa Board of Nursing's Articulation Plan. The credits from this associate degree can then be transferred to another participating Iowa institution of higher learning in order to further education and earn a bachelor of science degree in nursing (BSN). By first attaining an associate degree, students will have the benefit of being able to practice as a registered nurse while pursuing the BSN degree at their own pace. Briar Cliff University in Sioux City, IA has a cooperative program with St. Luke's College to provide students an opportunity to obtain an associate of science degree in radiologic technology from St.Luke's College and a bachelor of science degree from Briar Cliff University. North Dakota State University in Fargo, ND has a cooperative program with St. Luke's College to provide students an opportunity to obtain an associate of science degree in radiologic technology from St.Luke's College and a bachelor of science degree from North Dakota State University. Concordia University in St. Paul, MN has an agreement with a bachelor's degree in pulmonary science upon completion of the associate degree in respiratory care from St. Luke's College.